An Eagles fan stands on a Colin Kaepernick jersey and sings the national anthem during a tailgate at Lincoln Financial Field on Sept. 11, 2016. The turbulent sociopolitical climate in 2016, an election year with persistent conflicts over policing and racial justice, took a predictable turn into the realm of sports last month when San Francisco 49ers quarterback Colin Kaepernick became the face of a protest movement and refused to stand for the playing of the national anthem. 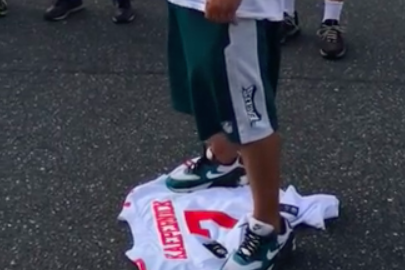 Outside Lincoln Financial Field for Sunday's Eagles opener against the Cleveland Browns, several tailgaters showed exactly how they felt about Kaepernick's protest. Standing atop his jersey, one fan led a small group in a rendition of the national anthem as they all held miniature flags. We're all well aware by now that this has become a deeply polarizing issue. While some commentators have railed against Kaepernick's "dishonorable" actions, others have called his stance "patriotic." President Barack Obama defended Kaepernick's actions as an exercise of his constitutional right, regardless of whether he and other Americans agree with it. Still others, like PhillyVoice contributor Al Morganti, believe Kaepernick was timely in his protest but misguided in his choice of venue. There have been several cases of figures both big and small following Kaepernick's example. Last weekend, a South Jersey high school football team kneeled in unison for the national anthem, and singer Chris Brown refused to stand for the national anthem at a charity basketball game commemorating the anniversary of Sept. 11, 2001. Was Sunday's scene at the Linc for the Stars and Stripes? On the anniversary of 9/11, of course it was. Then again, there's a high likelihood that this was also about throwing some shade at former Eagles coach Chip Kelly, whose widely mocked 49ers wound up thumping the Los Angeles Rams in a 28-0 shutout on Monday Night Football.